People with diabetes are advised to stop using and return specific lots of Accu-Chek Aviva and Accu-Chek Performa test strips following a recent recall by the manufacturer. 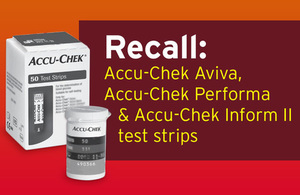 Accu-Chek Inform II test strips have also been recalled but are supplied in the UK by Roche for professional use only. The test strips, commonly used by diabetics for blood glucose testing, may give increased strip error messages prior to dosing with blood and in some cases may give falsely high or low readings which may be hard to detect. The Medicines and Healthcare products Regulatory Agency (MHRA) are urging users to check the lot numbers of their test strips against the lot numbers listed in the table below. More information can be found in this field safety notice. It is estimated that more than 260,000 packs have been affected. If anyone finds they have test strips from the affected lots, they are advised to seek alternative testing methods and return affected lots to their pharmacy or shop where they will be offered a replacement. It is also advised anyone with concerns about their blood glucose readings should discuss this with a healthcare professional. It is incredibly important that people living with diabetes are able to rely on the technology that is designed to help them manage their blood sugar, so we’d strongly recommend that anyone using these test strips check their batch numbers and get replacement strips accordingly. Inaccurate readings could mean you over- or under-dose with insulin, which in the short term can cause problems with hyper and hypoglycaemia. If you’re worried about your readings, we’d recommend speaking to your GP or a pharmacist as soon as possible.